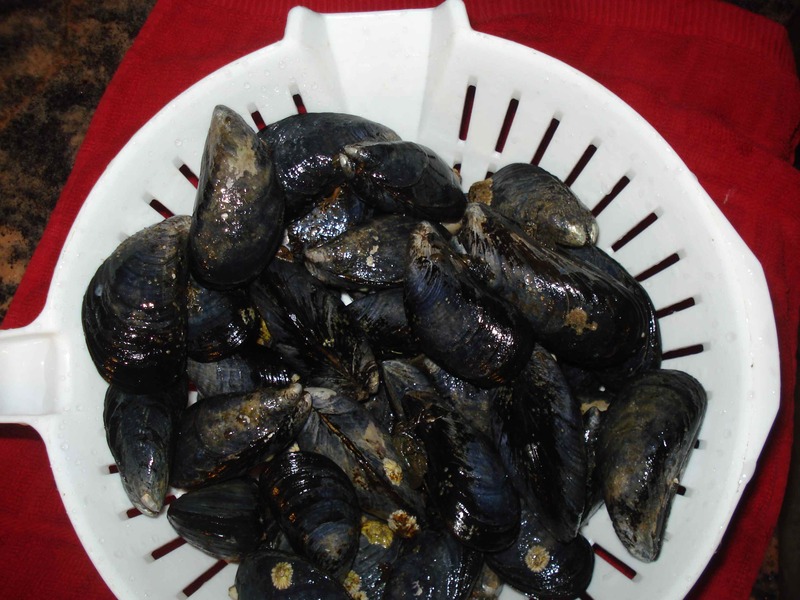 WILD CAUGHT MUSSELS–Delicious Feng Shui! 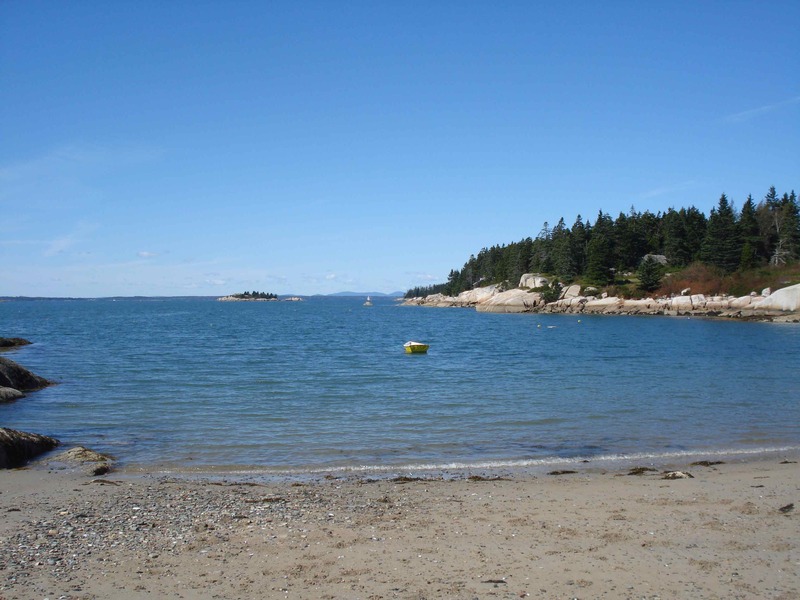 Sand Beach, Stonington, Maine where I harvested the wild mussels. Today I had the good fortune to discover our beach had an extremely low tide that divulged a bounty of fresh wild mussels clinging to rocks near the shore. I had gone to Sand Beach with my bf and our dogs at the end of the day to get some fresh air and exercise. We’ve had a spate of marvelous Indian Summer days this week (last week was 37 degree nights, this week we had 80 degree days) and we’ll be leaving for winter digs soon. Any excuse to get out and enjoy is always welcome! Anyway, I had never harvested wild mussels before. And since I wasn’t prepared with a bag or vessel, I used my turned up t-shirt hem to carry my load o’ mussels back home. Wild mussels ready to be cleaned. Note the near black color. Once there, I called my friends Caty & Captain Frazier of The Lobster Shack to find out if it were safe to eat these wild caught mussels and how to cook them. Captain Frazier said that if the mussels come from near the lowest tide line, are nearly black in color, and were attached to rocks before I pulled them off then they should be safe to eat. I was thrilled to hear that though some of them had barnacles on them, they would still be good to eat! The Fraziers recommended cooking the mussels in a covered wok with olive oil, garlic, and favorite spices tossing them with a spoon until the shells open wide. 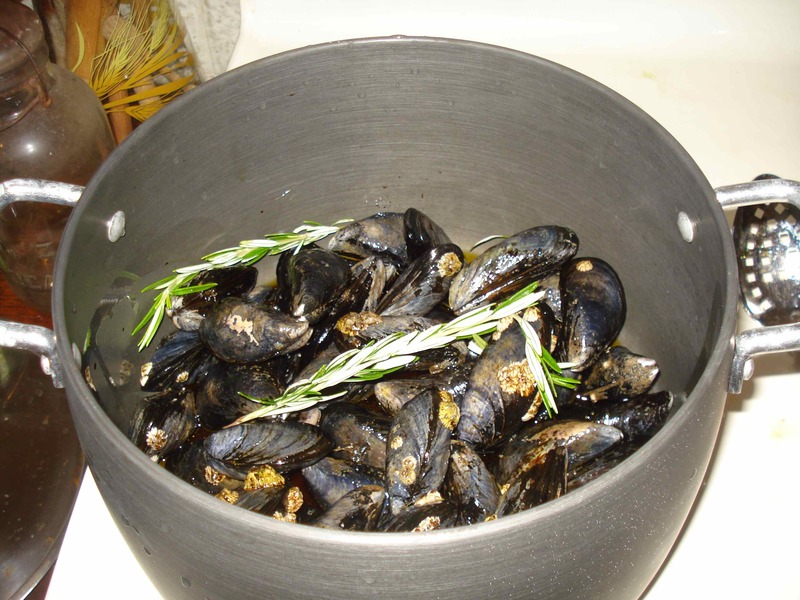 A nice big pot or wok filled with mussels and your favorite flavors. Not having a wok handy, I used a large pot. I first cleaned the mussels very well with water to get all the beach sand off them. They didn’t have long beards like most mussels and I gather that is because these are wild caught. Caty Frazier said that most mussels you get from fisherman and seafood companies are cultivated mussels that are grown on a string, believe it or not. The wild ones attach themselves to rocks. The finished product plus sweet corn on cob and a green tossed salad. I used garlic flavored olive oil–just enough to cover the bottom of the pot. Then I added some balsamic vinegar (I never measure anything when I cook but I gave it a healthy shake of the bottle). I tossed in a few sprigs of fresh rosemary and a few slices of fresh ginger. Then kept stirring the mussels every few minutes and keeping the pot covered so they could steam open. It didn’t take very long for that savory broth to fill my kitchen with a most auspicious aroma! 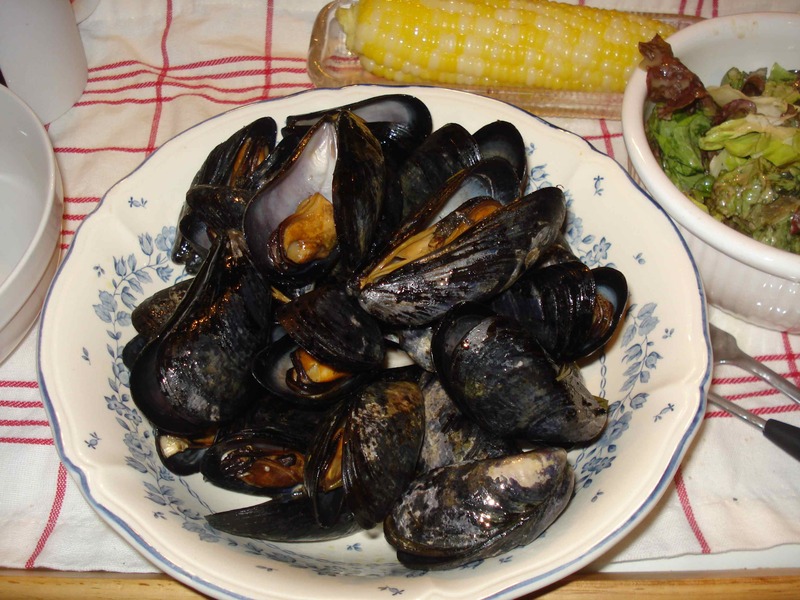 I served the mussels with sweet local corn on the cob and a tossed green salad (all of the veggies from The Stonington Farmers Market). Is life good? You bet it is! When your feng shui is in alignment, good things happen. Enjoy the little things and the rest will fall into place. Do you know how to pay attention to the signs and omens all around you? Synchronicity is more than just a song by The Police. It’s when you notice things surrounding you that correspond to your mood or answer questions you were thinking about. It’s almost as if you’re getting messages from the universe. The ancients called them signs. You might know them as affirmations. They come when you are paying attention and listening with your heart. I’ve written about this before. Photo courtesy of Deer Isle Chronicles. This week I left the island for a few days to take a short road trip. I had been feeling stressed out for various reasons and needed to get away so I seized an opportunity that came up suddenly. While driving along the road, feeling anxious/depressed/tired/ and emotional I began to cry a little. Within moments there was a sign ahead of me on the right—an actual sign that I wish I had stopped to take a photo of. It was written in black letters on a white board and said “Recover While Away”. Talk about instant karma! I pondered the words for awhile wondering what the actual sign’s purpose was other than its hidden message for me. It was a few days later that someone told me the sign advertised upholstery recovering for summer people who go to winter homes! On my way home (after the requisite recovery I made on my retreat!) I seemed lighter and happier. I even saw an American bald eagle swoop down across the highway in front of me and a few minutes later I witnessed a great blue heron going in the opposite direction. Both are wonderful omens of Spirit. 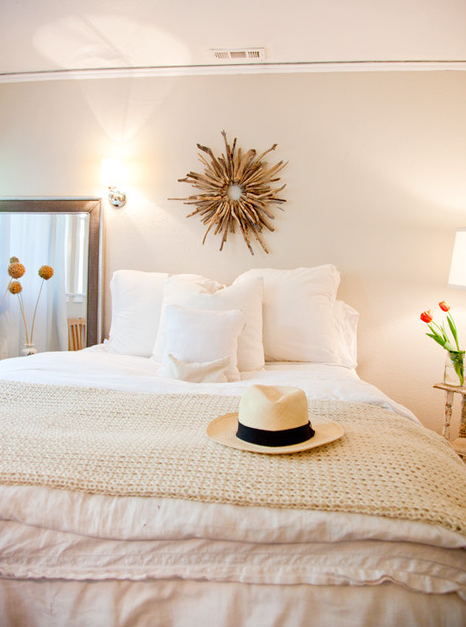 CAN YOU SPOT THE FENG SHUI FLAWS IN THIS BEDROOM? There are at least 5 feng shui flaws with this bedroom photo. Can you find them? Do you want to know why they are considered problems? I saw this photo on Apartment Therapy, one of my favorite places to hang out in the blogosphere. At first I was attracted to it but then I looked closer and noticed that there are a lot of feng shui “no-no’s” depicted here. Try to find them yourself with YOUR feng shui eyes and then check your answers against what I’ve written below. *The gigantic mirror placed against the wall by the bedside is not good placement. It also will stir up a lot of energy that makes for a less than restful night’s sleep–remove it! *There is one wall sconce on the wall. If you like wall lamps, you should put one on each side for balance. *There are dead seed pods in a vase on one side of the bed and a cut flower arrangement on the other. One says death, one says life. Which one do you think is good for feng shui? * There is only one bedside table and one bedside lamp. Unless this is a guest room where you’re not encouraging someone to stay a long time, get a matched pair of each.